We're excited to mention a new feature of Guides embedded widget. It's been our goal to provide a way to not only customize, but extend the customer support experience in a unique way that makes sense for your business. Today you can now extend the widget even more by hooking into events that are triggered when a customer takes actions inside your knowledge base. Right now you can hook into ratings and other events and provide a better customer experience. 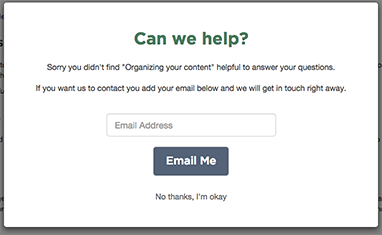 For example if a customer rated an article as unhelpful, you could display a modal and ask them to contact you to get in touch to better help them. Learn more about hooking into Guides widget events.